Light and easy to handle, it is high spin and control level. Because bow sense is not feeling too much, but take a firm rotation is in the drive at the time, it draws a high arc. In particular loop drive of the Vega Japan draws a mess high arc, it falls securely into the opponent's court. However, it is not a little momentum is insufficient when compared to carbon, but still enough power has been secured. Shot feeling is mild not too sound in hand. When you just impact is firmly in hand, and allow you to type in and gently sounds very pleasant sensation. Spin, because the control is good I want to recommend to the people of a stable drive subject. 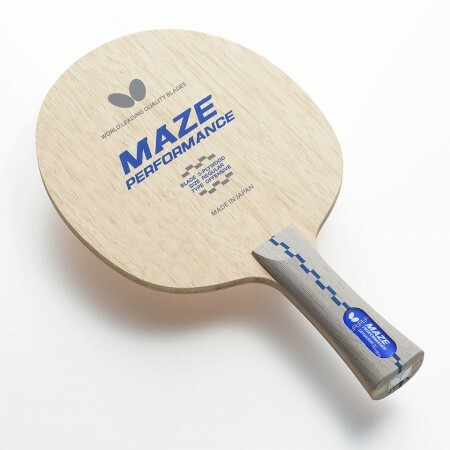 Also easy to handle because the price is also affordable, it is also recommended for those who have started a game of table tennis. so sa （Experience：４〜５ years）	In the first racket! It is the racket I bought for the first time. It was extremely easy to handle and boosted growth. It can be used without incongruity even with any kind of rubber, it has power. It is recommended for beginners, but I think that it can be used even if it becomes an advanced player. Salmon salmon （Experience：４〜５ years）	Easy to use! light! First of all, this racket is light and very easy to control! Even if you put a heavy rubber on it also makes it easy to rotate it is just right. It is possible to scored the opponent's unexpectedly with the reverse motion because it is easy to control the ball very much in Taizo technology, the drive in Nakazaki etc. Although it is light, I recommend it to beginners, but intermediate users can use it at all! Because it is cheap and light, it can not be said for beginners. Even middle - ranked people are light, so you can stick a heavy rubber, especially because you do not have to be nervous to choose rubber, it is a very good racket that can fit your way of fighting! It is a racket you want to use once! katsuo000 （Experience：More than ２０ years）	Easy to use! Introductory racket! It was borrowed because members of the club were using it. Anyway it is very easy to control! ! I understand why the owner challenges from the receive, such as Chiquita in an offensive posture. I have a pretty stable impression when I was able to apply my own rotation. It is difficult to put a little power, but I felt that there is no choice but to compensate for with muscle training. There is also a board thickness, if you combine a hard rubber, you can put out the power that can be misplaced. While refining basic technology with this racket, I think that it is good to go to the special plywood and 7 plywood to win. I definitely recommend it to beginners. To my daughter, I think that this is the first racket of five plywood.